The other day Jon shared many amazing leadership attributes that were in Paul. I have read them many times since then. One of the common themes among many biblical leaders is their faith in God. God has a divine plan for us all and he equips us if we listen and follow his examples. Hebrews 13:21 God will –equip you with everything good that you may do his will, working in us that which is pleasing in his sight, through Jesus Christ, to whom be glory forever and ever. I’ve previously read through Nehemiah without totally reflecting on his amazing leadership and passion to listen faithfully to God. His faith in God, his non-judgmental direction he provided to all who listened, persistence, and courage to follow through in adversity in order to complete a task. The job of rebuilding Jerusalem’s city wall was a daunting job that at first brought Nehemiah to his knees in agonizing prayer and later brings him to his knees in prayers of joy. Nehemiah’s dedication to God and prayer is modeled throughout this story. Often an opportunity will arise in our job or in life a situation may seem too hard to accomplish and won’t go according to our plan. What if we responded more like Nehemiah. I can be quick to make up an excuse, pass it on to someone else, jump ship, or just complain about it. Often it is my pride or fear of failure that holds me back because we depend on ourselves to complete something and afraid of failure. I’m reminded in Matthew 11:28 Come to me, all who labor and are heavy laden, and I will give you rest. Through God, Nehemiah’s was equipped with skills including; having vision , organization , management, supervision, courage in adversity, and a master of encouragement. 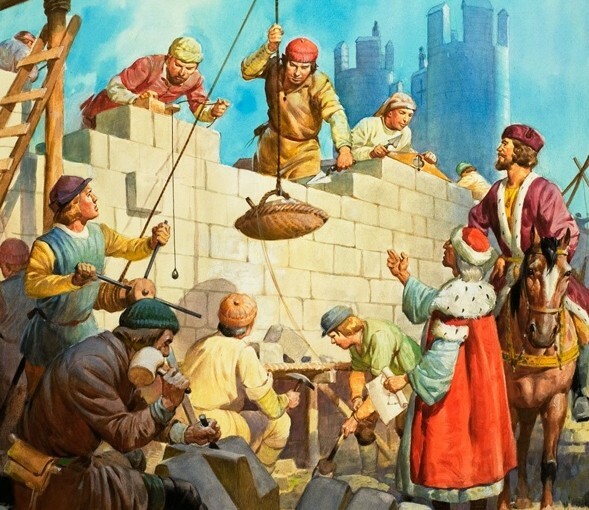 Nehemiah and the many families of believers rebuilt the wall around Jerusalem while rebuilding their own faith in God. Nehemiah used prayer throughout the unbelievable 52 days it took to rebuild the wall. These prayers were asked, heard, and met by God. Do I first use prayer in solving my own problems? We may not all be building physical walls but what is God asking us to build? Are we listening? Pray for vision, courage, faith, and follow through to see and complete all things God has planned for us. Thank you God for providing us with the amazing leader in Nehemiah who truly wanted to build your kingdom. Nehemiah 13:14 Remember me, O my God, concerning this, and do not wipe out my good deeds that I have done for the house of my God and for his service. While trying to be the best leaders we can whether at work or home I’m also reminded to always “practice what you preach” (Matthew 23:3). I’ve have been a hypocrite long enough in my life and continue to strive towards cleaning the inside while not just portraying the outside. (v.26) Through God’s mercy and his blessing of a wife and two children this saying holds so much more value when I don’t follow this principle. The greatest leadership I can offer is loving servant leadership. Matthew 23:4 Whoever exalts himself will be humbled, and whoever humbles himself will be exalted.